Lake Geneva (French Lac Leman or Lac de Genève; German Genfersee) is the largest Alpine lake in Europe, situated in the southwest of Switzerland near the Haute-Savoie of France. 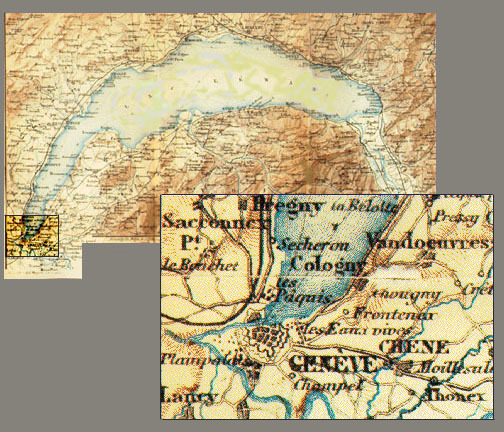 The crescent-shaped and strikingly clear lake is formed by the Rhône, which enters at the eastern end, and leaves on the west, through the city of Geneva. Lausanne is also situated on the lake, as are the French resorts of Thonon-les-Bains and Évian-les-Bains. The north shore is rich in vineyards, which run from the lake to the Jura Mountains.